I’m not exactly sure what they are, but they look nice against the spray cans on the masthead. i like how the single photo post is starting to proliferate. we’re running out of things to say . . . Funny, you said that yesterday. It’s summer; our brains are overheated. Is there vodka in that “candy”? 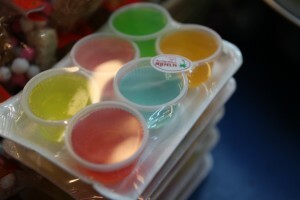 It looks like Jello. Does Jello qualify as candy? I don’t like candy, but I like Jello. It could also be: Many Colored Urine Cups. Do they sell that at Hogwarts?